Interstate 587 will overlay the U.S. 264 freeway east from its split with U.S. 64 (Future I-87) at Zebulon, to Greenville. 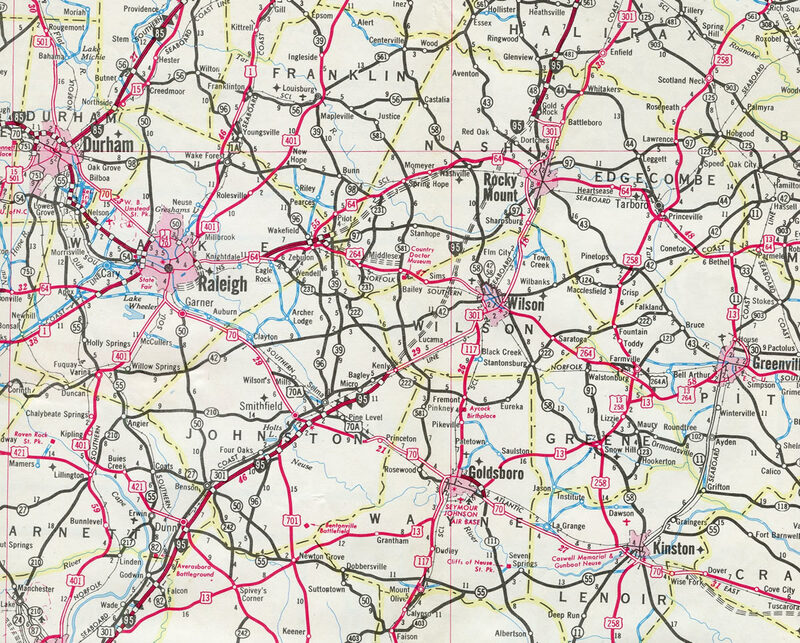 The rural freeway joins Raleigh with Wilson as well, and partially coincides with Interstate 795 between I-95 and its continuation south to Goldsboro. U.S. 264 approaches a half built cloverleaf interchange (Exit 73B) with the Pitt County bypass around Greenville. The interchange includes grading for the future southwestern bypass (NC 11). I-587 will end here, with U.S. 264 arcing northeast around Greenville to U.S. 13 near House. Photo taken 07/28/13. A grassy area alludes to the eventual Exit 73A for future NC 11 south to Kinston. The Quad-East plan calls for connecting four of the largest metropolitan areas east of I-95, including Greenville, Wilson, Goldsboro and Kinston. 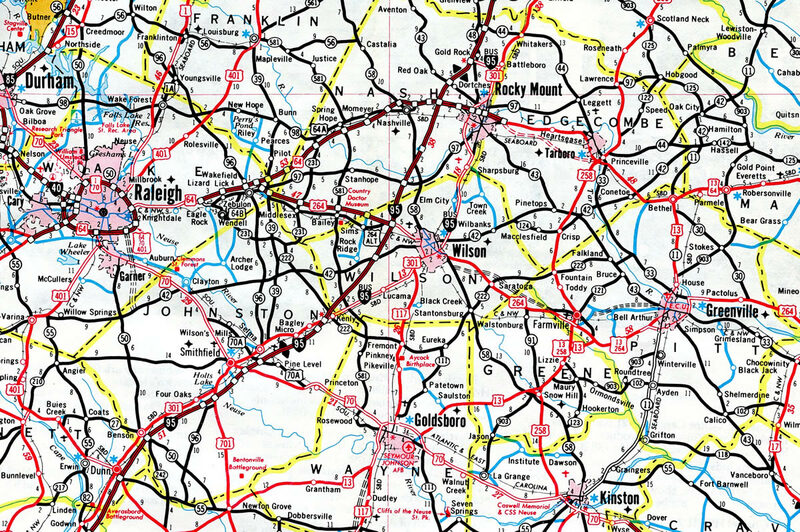 This is envisioned as an interstate quality loop, with I-795 constituting the Wilson to Golsboro leg and future I-42 representing the Goldsboro to Kinston segment. An extension is underway for the Felix Harvey Parkway (NC 148) freeway north from NC 58 to NC 11, while work on the southwestern bypass for NC 11 in Pitt County started in 2016. NC 11 between the two freeways will need future upgrades to Interstate standards to complete the loop.6 Photo taken 07/28/13. U.S. 264 loops onto the Pitt County bypass as the freeway mainline transitions into Stantonsburg Road east to East Carolina University. Stantonsburg Road is not the old alignment of U.S. 264, as the US highway previously overlapped with U.S. 13 along Dickinson Avenue to the south. Photo taken 07/28/13. Traffic separates from U.S. 64 and 264 east at a trumpet interchange (Exit 436) on the north side of Zebulon. 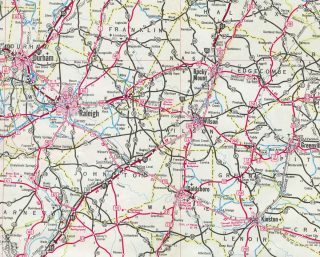 “Greenville would benefit from U.S. 264 interstate designation.” Public Radio East, September 19, 2016. AASHTO Standing Committee on Highways – SCOH Meeting. AASHTO 2016 Annual Meeting – Boston, MA, November 13, 2016. brochure, Pages 47 & 48. “Transportation Association Recommends Approval of Future Interstate Designation for U.S. 264 to Greenville.” North Carolina Office of the Governor, press release. November 15, 2016. “Governor McCrory Announces Designation for U.S. 264 to Greenville.” North Carolina Office of the Governor, press release. November 21, 2016. 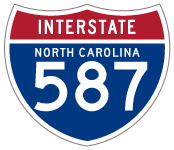 “Re: Interstate 587 (NC)” online posting by LM117, AARoads Forum, November 15, 2016. 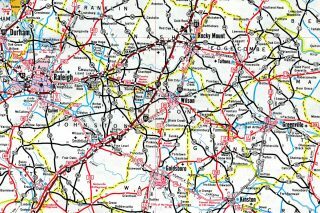 “How Quad-East could connect four of eastern Carolina’s metro areas.” WNCT (Kinston, NC), August 9, 2016. Page updated November 22, 2016.